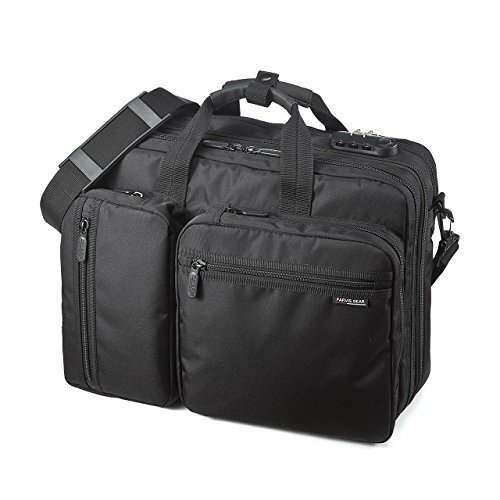 This 3-in-1 (Hand / Shoulder / Backpack) Laptop Briefcase is an upgraded version of the previous Briefcase. ◆3 Carrying Styles: You could use it as backpack shoulder bag and hand bag. Also the straps can be hidden when you use it a hand bag and shoulder bag. ◆Multi Pockets: Two zippered main compartment, five zippered pockets(four pockets and one back pockets). Perfect for separating your stuff and carrying what you need. ◆The Room Size : 15.15×1.77×10.6 inches . Fit up to 15.6 inch laptop .Please check your laptop size before order. ◆Securirty : Built-in combination lock secures contents, letting agents safely access your bag, no more cut cable locks. ◆Expansion :Expansion compression system increases packing capacity, then compresses back to original size to keep contents secure. ◆Multi Functional: It's a perfect gift for business trip and overnight stay, school, leisure, travelling. Dial the 3 wheels to 0-0-0, which is the default combination setting for SANWA bag. ●Step 1: Rotate the 3 wheels on the lock to the current combination and open the bag. ●Step 2: Press and hold the reset button on the side of the lock. ●Step 3: Turn the 3 wheels one at a time to create a new, 3-digit combination and release the reset button. ✔ 3 Carrying Styles: You could use it as backpack shoulder bag and hand bag. Also the straps can be hidden when you use it a hand bag and shoulder bag. ✔ Multi Pockets: Two zippered main compartment, five zippered pockets(four pockets and one back pockets). Perfect for separating your stuff and carrying what you need. ✔ The Room Size : 15.15×1.77×10.6 inches . Fit up to 15.6 inch laptop .Please check your laptop size before order. ✔ Secure and 6cm Expansion: Built-in combination lock secures contents, letting agents safely access your bag, no more cut cable locks. Expansion-compression system increases packing capacity, then compresses back to original size to keep contents secure. ✔ Multi Functional: It's a perfect gift for business trip and overnight stay, school, leisure, travelling. If you have any questions about this product by SANWA, contact us by completing and submitting the form below. If you are looking for a specif part number, please include it with your message.